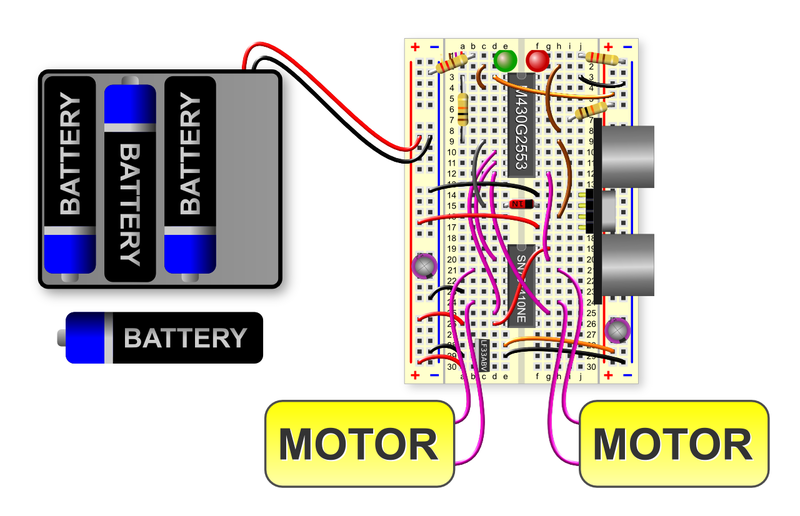 These instructions outline a shorter method of building the RoboSlam robot, custom adapted for the CAO Open Day in the DIT School of Electrical and Electronic Engineering (Saturday 28th March 2015). If you’re reading this in Internet Explorer, please switch to Firefox now. Some elements of these instructions will not display correctly in Internet Explorer. 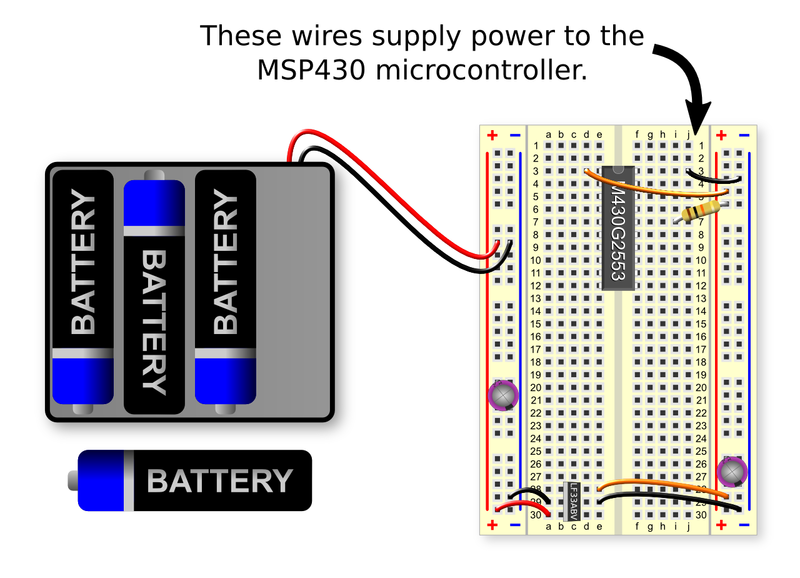 In this stage, we build a basic breadboard circuit using the MSP430 microcontroller to blink two light emitting diodes (LEDs) on and off. 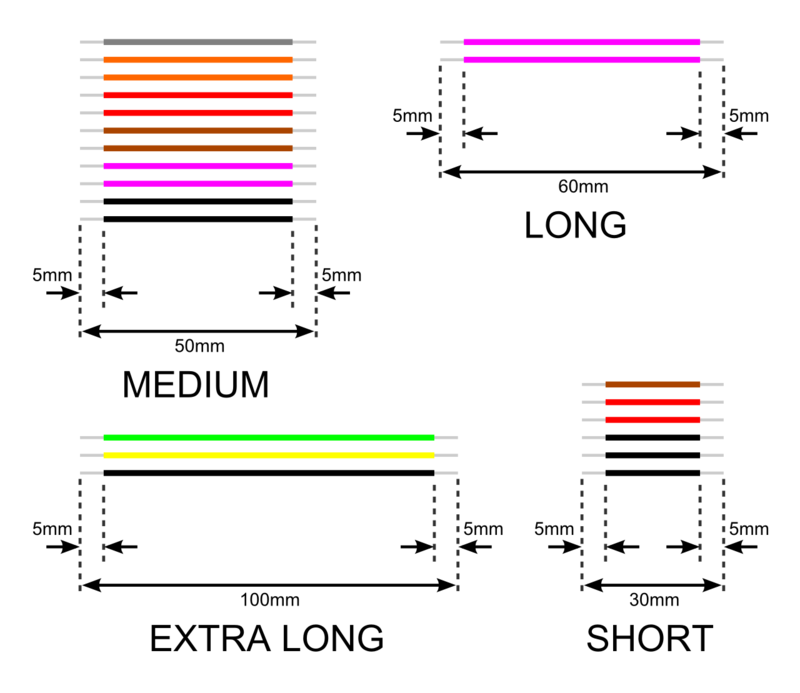 These LEDs are used as indicator lights. 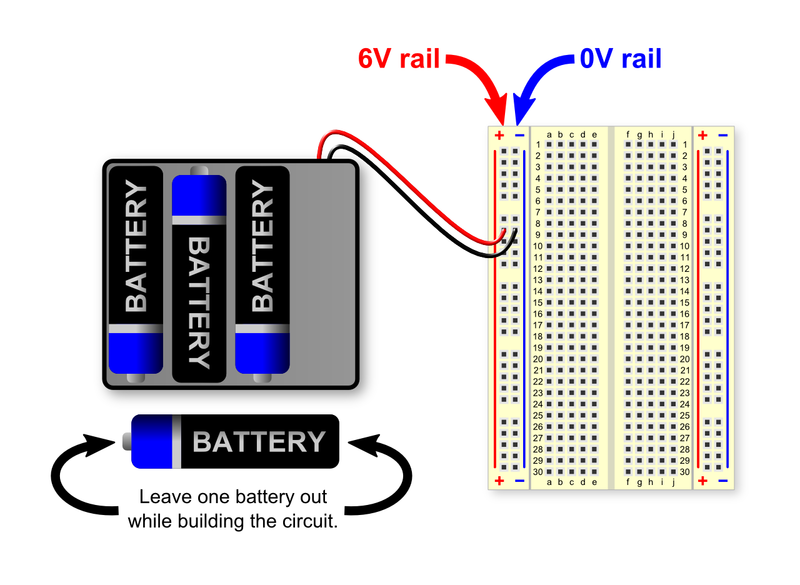 The battery pack supplies 6 volts to the circuit, but this supply voltage is too high for some of the components in our circuit, so we need to use a voltage regulator to provide a lower voltage. 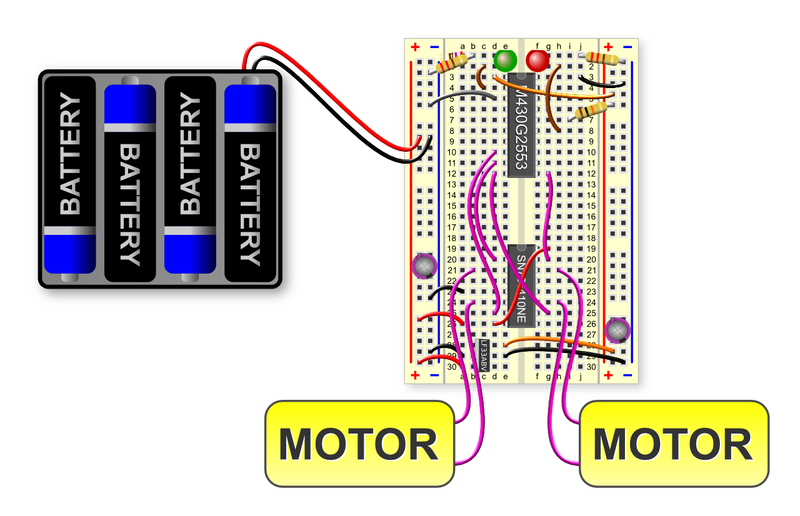 The LF33ABV is a 3.3 volt regulator which we connect as shown below to feed a stable 3.3V supply to the red rail on the right hand side of the breadboard. Very carefully insert the LF33ABV voltage regulator (the black rectangular component with three legs and a metal back plate) into holes c28, c29 and c30 of the breadboard. 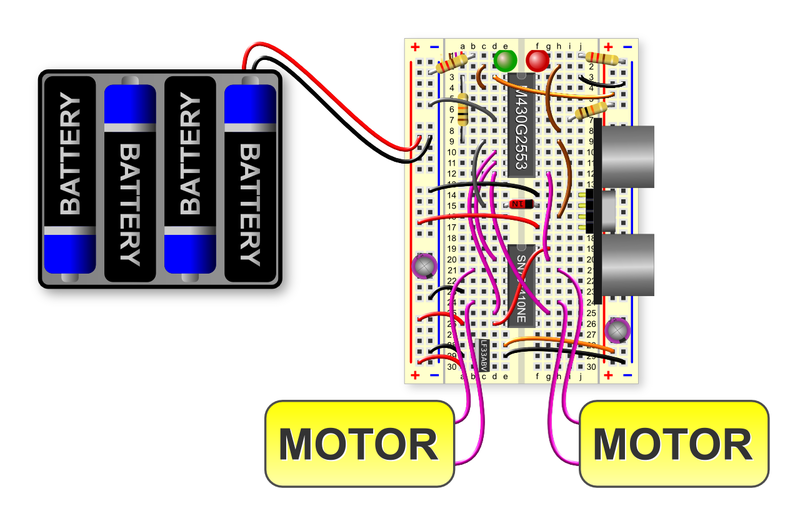 The metal back plate of the voltage regulator should be on the left, as shown in the illustration below. 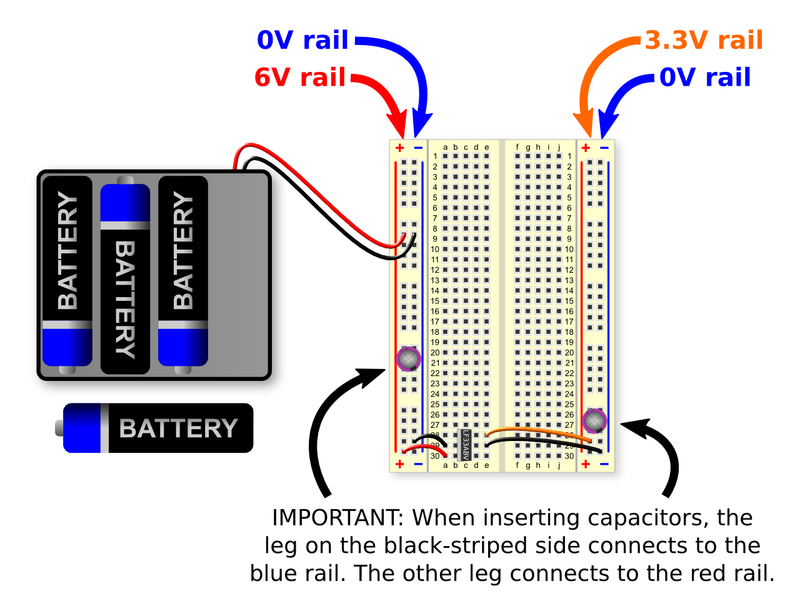 It’s tricky to coax the three legs of the LF33ABV into the breadboard without bending them, so be careful! Connect a short red wire between hole a30 and the red rail on the left-hand side of the breadboard (6V). Connect a short black wire between hole a29 and the blue rail on the left-hand side of the breadboard (0V). Connect a medium orange wire between hole e28 and the red rail on the right-hand side of the breadboard (3.3V). 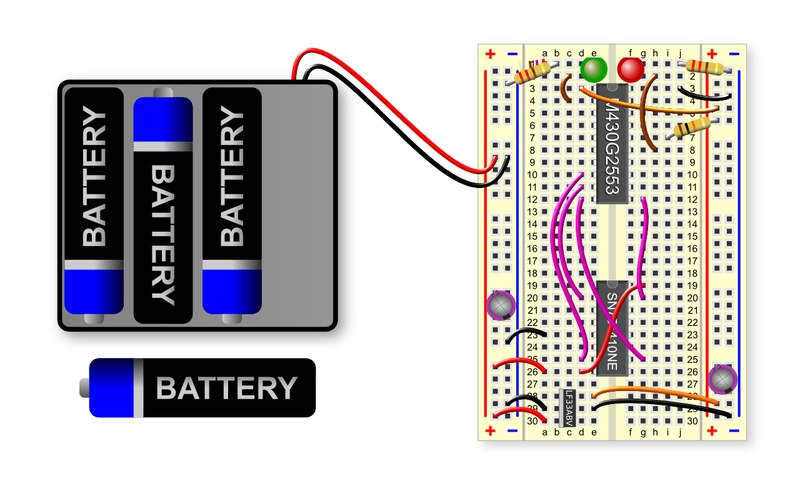 Connect a medium black wire between hole e29 and the blue rail on the right-hand side of the breadboard (0V). At this point, the two LEDs should be flashing on and off, alternating between red and green. If not, please ask a facilitator to check your circuit. 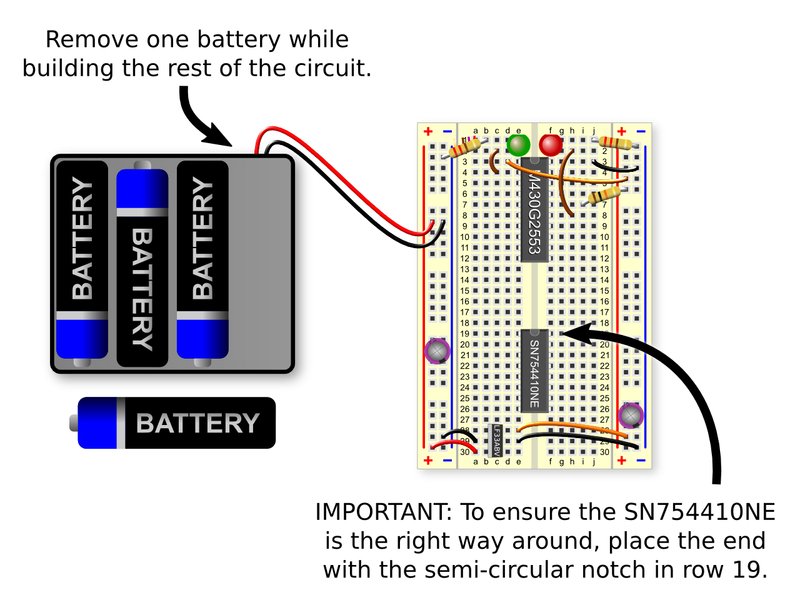 Add the SN754410NE driver chip to the breadboard as shown below. The end of the chip with the semi-circular indentation must be in row 19. To test the motors and ensure we can control them in both directions, we will make the robot drive in a zig-vag pattern. 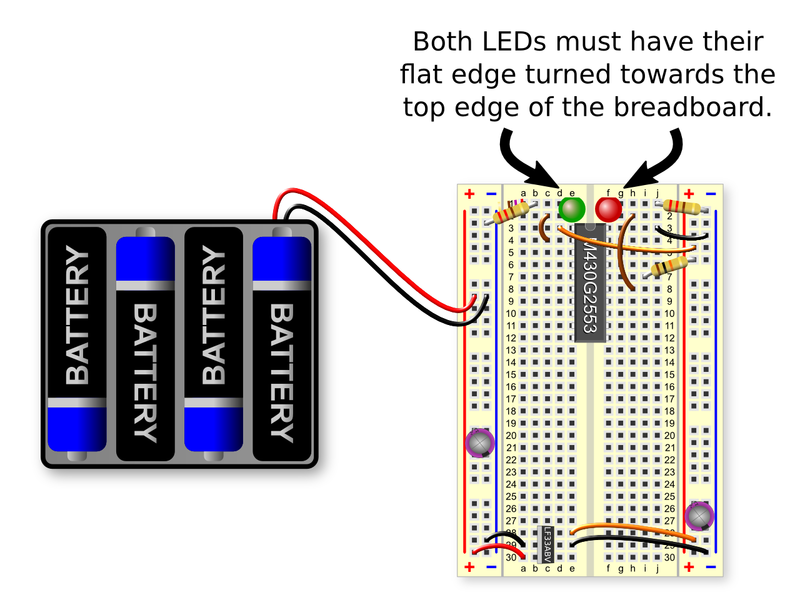 To enable the “zig zag” behaviour, simply connect a medium wire between hole d5 and the blue (0V) rail on the left side of the breadboard. At this point, the robot should be driving in a zig-zag pattern. 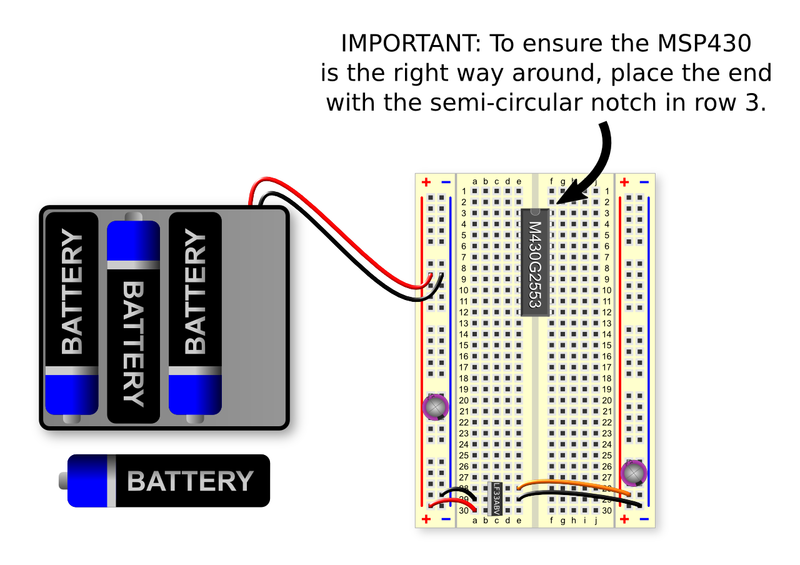 If not, please ask a facilitator to check your circuit. Connect the diode between hole e15 and hole f15, taking care that the end of the diode with the black stripe is inserted into f15. Connect a 10kΩ resistor (colour code: brown, black, orange, gold) between hole a3 and hole a9. To test the rangefinder, we will make the robot perform a simple sumo wrestling action. When an object is detected in front of the rangefinder, the robot drives forwards, but when nothing is detected, the robot turns around on the spot.